This is hopefully my new betta tank. Tell me what you think and any improvements i might need before I get my betta It is 3 gallons. I used sand and a mix of live and silk plants. 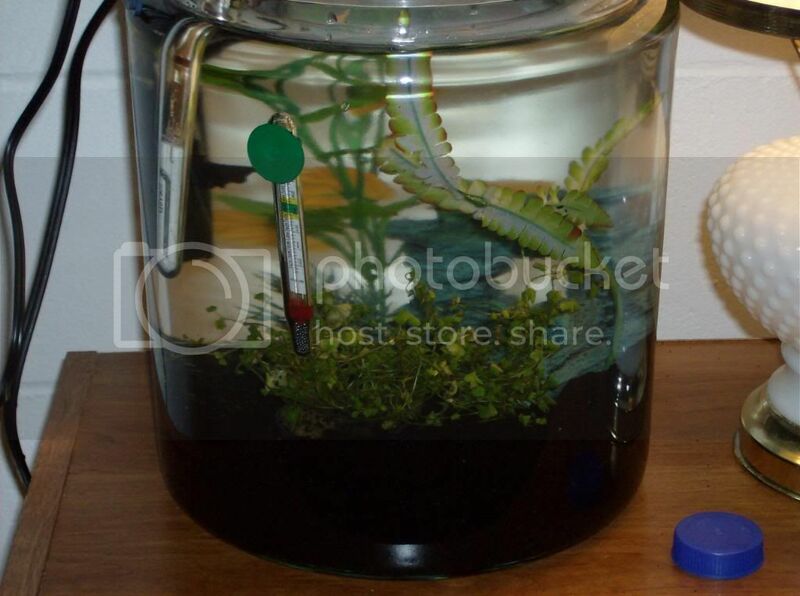 A 1-3 gallon low flow submersible filter. and a 1-3 gallon side tank heater set to 75F. I actually turned a 3 gallon unused cookie jar into the tank. As long as the flow from the filter is not too strong I see nothing wrong with it! I have a 7.5 watt heater for my 3 gallon too - just keep an eye on the thermometer bc in a cold room the heater is not always enough. 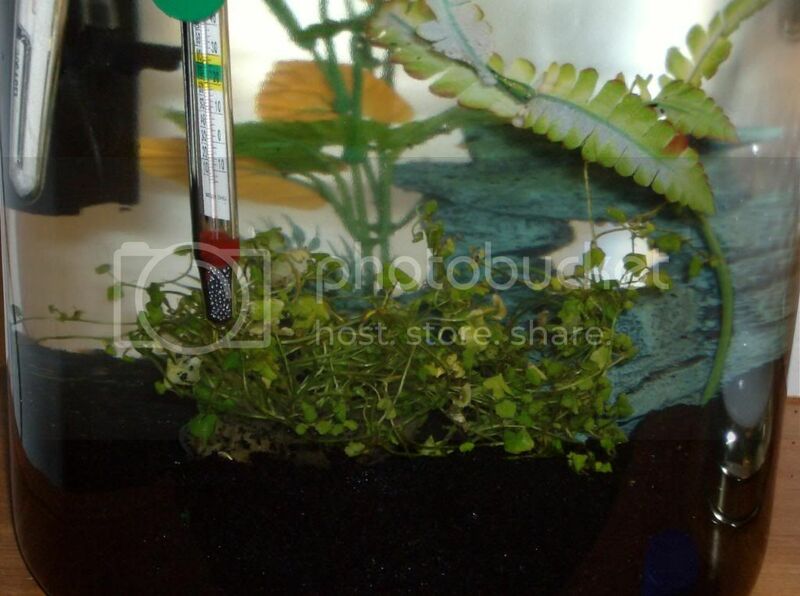 The shape isn't really great...bettas swim horizontally and also have to come up for air. The fact that it's heated and filtered is good, though. I know it's temporary but please don't use a reptile heater on an aquarium...that can be pretty dangerous and most undertank heaters specifically say not to use them with aquatic habitats. What live plants are you using? Ok, I will remove the heater luckily I dont have a fish yet so I can get everything perfect for the little guy. Right now I have a small group of Hemianthus Callitrichoides, and hopefully a moss ball. What would be good options on tanks then? I would recommend at least a 5-gallon for stability, ease of maintenance/cycling (no full water changes needed if cycled), and for more heater options . There are a ton of 5-gallon aquariums to choose from but I'd go for one in a more rectangular shape like a regular Eclipse, Mini-Bow, or an All-Glass standard 5-gallon (as opposed to, say, the Eclipse Hex which is taller). I have a couple of 5-gallon aquariums running right now but am totally blanking on the brand. I can check tomorrow. They were pretty cheap and have been durable and easy to clean . Ah, that's what I was worried about. Your plant, often called "dwarf baby tears", requires high light to thrive. It looks like it's just getting indirect light right now and will probably die unless you upgrade to a tank that can support higher lighting (maybe go for compact florescent bulbs, they can fit in regular incandescent hoods but are MUCH brighter and don't give off extra heat). If you want to stick with a low-light tank you're going to be restricted to plants without high lighting needs like anubias, java ferns, various mosses, etc. Pet store clerks are often using myths and just wrong info to make a quick sale. Anyway, I'm looking forward to pics!! Looks too small for me too, better to get standard rectangular tank. We have about 20 bettas here and are just fine in 10gal tank. You can't keep 20 bettas ina 10g!! O.o I hope that's not what you meant! I think they meant 20 bettas in separate 10-gallon aquariums . Or at least I hope so, ha.